n this issue of the Evangelical Interfaith Dialogue, we depart from our regular format in order to best capture the nature of a unique form of interfaith dialogue between a group of Latter-day Saint and Evangelical scholars and pastors that has been going on for more than a decade. 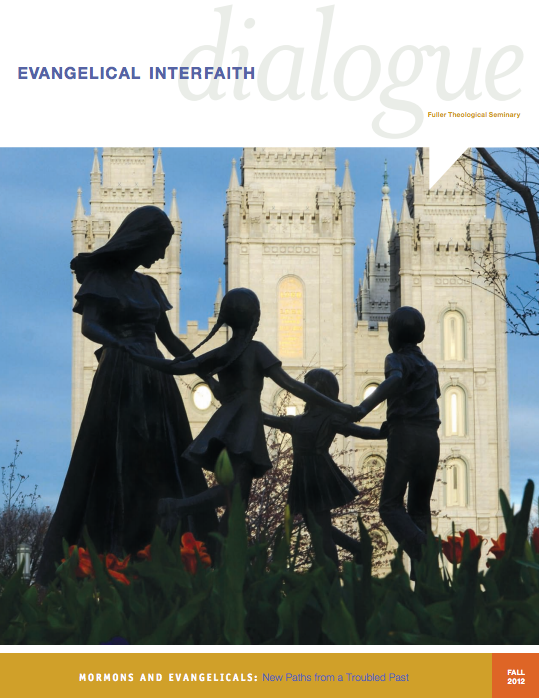 Instead of featuring one lead article with responses from several other authors, in this issue we have paired an Evangelical with a Latter-day Saint and asked them to respond to a specific aspect of this dialogue. In the first set of essays, Robert Millet reflects on key aspects in the development of the LDS-Evangelical dialogue and expresses his hopes for what is to come. Similarly, Craig Blomberg reflects on what he hopes will come in the future of this dialogue group and for the LDS community twenty years from now. In second set of essays, Spencer Fluhman and Dennis Okholm write about what drew them into this dialogue group and what has sustained their involvement of the last few years. Camille Fronk Olson and James Bradley each offer their reflections on these two sets of essays in light of their own participation in this dialogue group. In a helpful historical piece, Derek Bowen paints a picture of some of the theological, social, and cultural factors that led to this particular gathering of Latter-day Saints and Evangelicals and the major developments within this interfaith dialogue group. Based on his thirty years of pastoring in the Salt Lake City area, Bill Heersink offers stories and reflections on his experience as an Evangelical living among Latter-day Saints in the Utah valley.